A few years ago, Emma Coats took to Twitter to share 22 rules she learned about storytelling during her time as a Pixar storyboard artist. The rules are “a mix of things learned from directors and coworkers at Pixar, listening to writers and directors talk about their craft, and via trial and error in the making of my own films,” she later wrote in a blog post. After reading them, I couldn’t help but see their application to UX design. 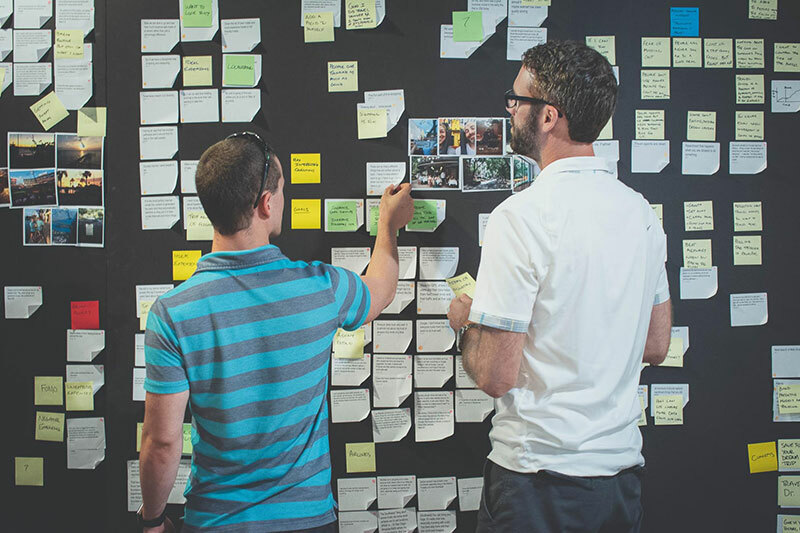 UX designers know the importance of telling a good story—we strive to give our users a comprehensive understanding of our creations with consistency, accuracy, and intuitiveness. Recognizing the relationship between these disciplines resulted in a relatively fluid translation of Emma’s rules into lessons for good UX. Think of these as a set of guidelines to facilitate your creative process. Your work will never come out perfect the first time. Users value products and services that are continually evolving, and they’ll tolerate waiting a week or 2 for the next release. What might look good visually may not be what your users need or want. Observe their needs with analytics, and listen to their gripes in user interviews. Of course, designers should still value intuition. Users may not always suggest the most relevant or appropriate solutions. Even so, making design compromises is sometimes necessary so your users feel heard. Maintaining a vision for your product is of utmost importance, but that vision can quickly become muddled with the quest for perfection. We often hear “release early and often,” and we should take that to heart. Embarrassment will always be a part of your first release. If it isn’t, you’re slowing the product down—and you’re most likely stifling its success. If your product is lightweight and focused, you’ll have the agility to quickly evaluate user feedback and apply it to the next iteration. 4. Once upon a time there was ______. Every day_______. One day ______. Because of that, ______. Because of that, ______. Until finally ______. An elegant solution to a perpetual problem can transform and solidify the user’s narrative. This type of narrative can be used as a “North Star” in early stages of product ideation in order to keep you and your team on the correct path. For _(blank user type)_, who has these _(user problems/frustrations)_ this product _(insert value props)_, unlike _(list competitors)_ who _(list competitors values/detractors)_, we _(list differentiators)_.
Simplify. Focus. Combine features. Cut features. Unnecessary features will harm your product far more than they’ll help it. You might feel like your product is losing value, but sticking to the essence of your product gives users something more concrete to grab onto. What problem is your software good at solving? Now create some relative problems that you don’t currently plan for. Did your system hold up or break down? Do you believe you should accommodate any of these newly discovered faults? If you need to add features to solve these problems, be sure to rigorously evaluate their necessity before committing them to a release. Imagine the ideal experience for your user and identify what problem(s) you intend to solve for them. What do you see as their optimal experience? This will define an accurate measurement for success that will help drive the decision-making process for your concept at an early stage. Finish and launch your product before adding extra features. Creating a good digital product is an iterative process. Once you’ve accomplished your core goal, share your solution and move forward. As soon as you publish your initial product, start gauging reactions in order to understand which secondary features and edge cases are necessary to focus your attention on. 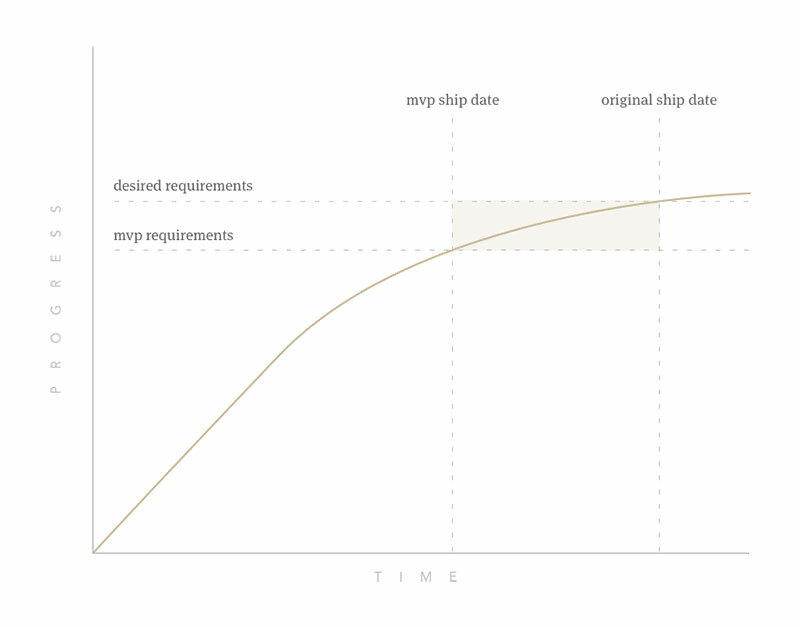 This graph illustrates the time benefit of reducing your initial feature set to a minimum viable product. Typically over the course of a product, you’ll find that the velocity of progress tends to decrease due to technical debt and difficulty. Finding a couple of unnecessary features for your current release can save you weeks—or even months. Don’t get hung up on your original ideas if you get stuck. List different ideas that could possibly work, or ones that may not work at all. You never know what might grow out of a wild idea. Evaluate products and software that you love. What you love about them is part of your design aesthetic and voice. It gives you insight on what you intuitively enjoy when interacting with technology. If you have a positive interaction with a product, chances are others will, too. Get your ideas out of your head and onto something tangible or visible. You’ll find that you’ll frequently bounce these ideas off others, thereby receiving more detailed and useful feedback. If you’re working with a team, don’t stop at whiteboarding sessions. Document and organize your discoveries into a war room where meaningful discussions about your concept can be facilitated. 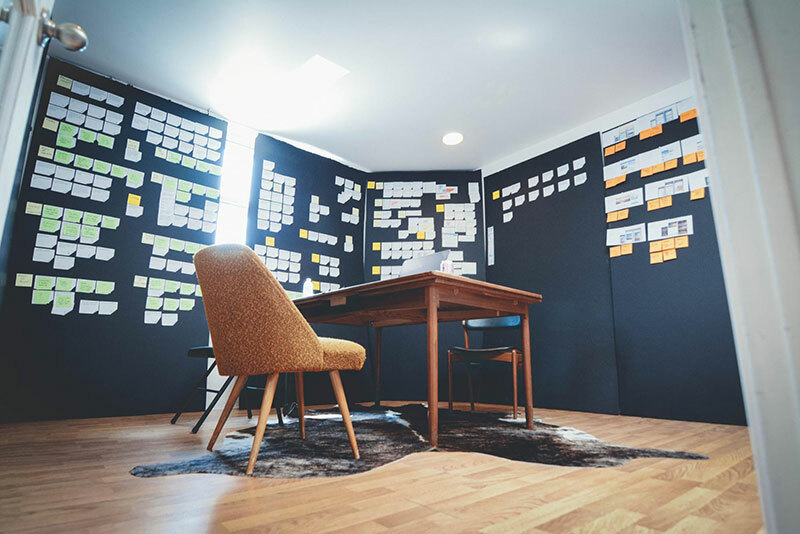 A look into a war room at Handsome during our preliminary design research phase. 12. Discount the 1st thing that comes to mind. And the 2nd, 3rd, 4th, 5th—get the obvious out of the way. Surprise yourself. This rule can be applied to almost any creative discipline. Give your product a distinct look and feel. Products that play it safe aren’t always memorable, and consumers will quickly get bored. Why are you solving this problem? Why do you believe that this problem, if solved, will be celebrated by the userbase? How much will it impact their lives? A positive impact will inspire people to share the product with their networks, and the solution will spread exponentially. Really put yourself in the shoes of your user—take off your business hat and be completely honest with yourself. Once you begin to see your user in the light of empathy, unnecessary solutions and ideas will be easier to identify and remove. Part of our user research process involves extensive documentation and the curation of vital user and client insights. We take these nuggets of information and group them into categories of similar thought. By doing so, we can evaluate the legitimacy of the client’s priorities, as well as identify areas where we should be focusing our empathy for the user. Attempt to break your design. Discover where particular users will run into walls and feel like their problems are being neglected. These problems may feel impossible to solve at first, but keep at it. The more improbable the problem is to solve, the greater the invested interest of your user will be. This will also give them a reason to root for the success of your product, promote it by word of mouth, and defend your product against your competitors. 17. No work is ever wasted. If it’s not working, let go and move on—it’ll come back around to be useful later. No design is ever wasted time. It’s all a process . If you never got bad ideas out of your head, you’d never have room for the good ones to blossom. If you set an idea aside, you’ll find yourself coming back to it later if it’s truly useful. Your best work will always come from demonstrating the concept to your peers. If you’re continually refining your work in a vacuum, then you’re guaranteed to overlook important issues. Identify the scenarios in which in a user would become frustrated, distracted, or dissatisfied. Documenting and addressing these concerns will go further than you realize. On the opposite end, beware of convincing yourself that a user will approach an issue with the same problem-solving technique as you. If it’s not obvious, it’s a friction point. Take the features of a product you dislike, and think about how you would have approached them. Which aspects are working, and which ones aren’t? Perhaps some parts don’t even need to exist at all. Understanding the working relationships between some features and identifying their weak points is a great exercise in developing perspective on products that need improvement. Evaluating software as an outsider to this degree will help you set a standard for evaluating your own product. 21. You gotta identify with your situation/characters, can’t just write “cool.” What would make YOU act that way? You need to identify with your users and their wide range of unique situations. Putting yourself in their shoes will give you a compelling starting point. But this doesn’t always lead to the correct answer. 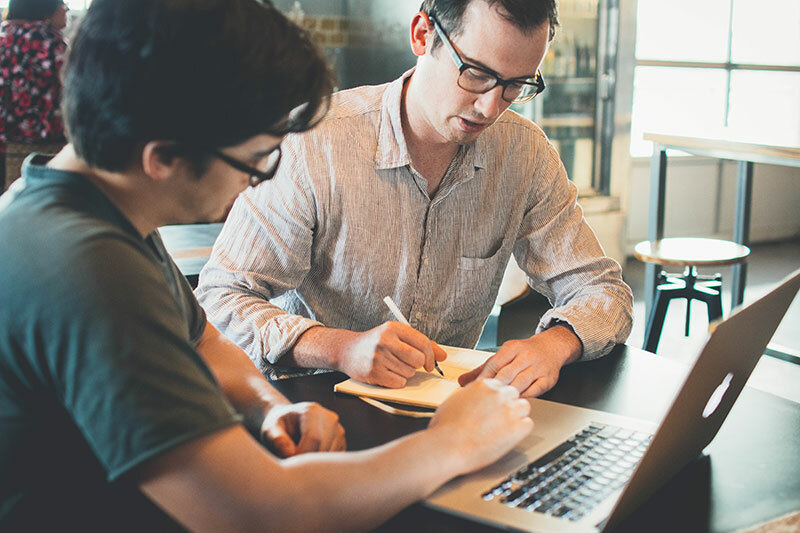 The only way to truly solidify your solution is through early and frequent user testing. No product, concept, or idea is above this rule. What’s the essence of your product? What’s the most economical version of it? Although it’s become a buzzword, the minimum viable product (MVP) is the most accurate way to describe the intended result. Reducing feature and scope of your product is always difficult, and non-MVP features aren’t always easy to identify. Try revisiting your elevator pitch and comparing the current state of your product to that. Are you doing that one thing well enough that your product can solve secondary or tertiary problems as well? If not, you might want to scale back until the next release. #storybasics 22: What's the essence of your story? Most economical telling of it? If you know that, you can build out from there. I’d like to extend a special thank you to Emma Coats. We are all storytellers, and I believe her 22 rules can be translated into a wide range of professions. As creatives, we should always strive to show conceptual work that stems from a meaningful decision-making process. And as product creators, the more we attempt to cross-pollinate great ideas from relative professions, the more likely we are to understand the commonalities of the human experience. Eric is a seasoned UX and UI designer stationed in Austin, TX, and currently working as a Product Designer for Handsome LLC. Growing up in Ohio, Eric attended Kent State University where he focused on print and interactive design. In his years dedicated to the digital design space, he has worked from ideation to launch with a wide range of agile product teams. Some of his past clients include FareCompare, Union Bank, Auto Trader, Kelly Blue Book, and Google.